Marysol Asencio is a full professor at the University of Connecticut with a joint appointment with El Instituto: Institute of Latina/o, Caribbean, and Latin American Studies. She received her doctoral degree with distinction in 1994 from Columbia University School of Public Health with a concentration in Sociomedical Sciences. Her scholarly interests revolve around race/ethnicity; gender; sexuality; health; and social inequality, in particular Latina/o sexualities. 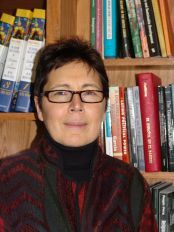 She has produced a body of work that includes books, guest edited journal issues, peer-reviewed articles and chapters as well as other publications. Her research has been published in top journals such as Gender & Society and Medical Anthropology. Professor Asencio has also received significant internal and external funding for her research and projects, including from prestigious organizations such as the Social Science Research Council and the Ford Foundation. She has received a teaching excellence award from Columbia University as well as teaching commendations at UCONN. Her service within UCONN and minority communities around social justice and diversity issues has been recognized with several awards and honors. Asencio, Marysol (editor). 2010. Latina/o Sexualities: Probing Powers, Passions, Practices and Policies. New Brunswick, NJ: Rutgers University Press. Asencio, Marysol. 2011. “Locas,” Respect, and Masculinity: Gender Conformity in Migrant Puerto Rican Gay Masculinities. Gender & Society 25(3):335-354. Asencio, Marysol and Katie Acosta. 2009. Migration, Gender Conformity, and Social Mobility among Puerto Rican Sexual Minorities. Sexuality Research and Social Policy6(3):34-43.